If you keep sensitive data on your iPhone such as passwords and account numbers, SplashID may be your next iPhone app. The app developer puts it best to think of SplashID as your personal safe on your iPhone. The app specializes in storing many types of personal and sensitive data such as account numbers, credit cards, user names, passwords, and more. I would question someone storing that type of personal information on their mobile device, but for those that easily forget things, this app is a great supplement. The information could be stored on a local computer but we all have more access to our mobile devices, such as our iPhone, than our mobile or desktop computers. SplashID features strong 256-bit Blowfish encryption, wireless backup, an automatic password generator, and these really neat anti-phishing URL icons that ensure users get to their desired websites without typing. 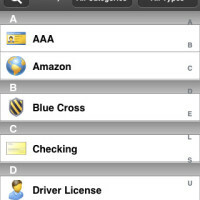 The app also allows a degree of customization by having users create custom icons that store a record or type of data. The latest update also brought many new features such as in-app purchase, search history, landscape support in web view, and a pattern unlock option. The pattern unlock option is probably my most favorite addition, as it allows users to create (trace) a custom pattern to access the app. The feature adds a great level of security as only the app user knows the custom traced pattern. The new update also added localization into French, German, Italian and Spanish. If you don’t already have a password manager and are looking for an app to provide a clean and easy to use interface, definitely check out SplashID. SplashID is available in the App Store for $9.99.